Hassle-Free Shopping with the Holiday Gift Guide! Had your fill of long lines and the crowds of holiday shopping? Not sure exactly what to get for your little ones? Then look no further than the Holiday Gift Guide at Discount School Supply! Not only will you avoid the lines and the crowds when you shop online, you can easily shop based on the interests of your little learners. You're sure to find something perfect for all of your young builders, explorers, crafters, readers, imaginative players and more with our easy-to-shop Holiday Gift Guide! Teachers, moms, dads, caregivers and anyone shopping for young children: shop the Holiday Gift Guide right now and find that perfect gift for LESS! Here's how to do it: visit Discount School Supply and click on the Holiday Gift Guide banner. Then, shop the product selection based on the interests of your young ones. For example, if your child "Likes to Build" then you will find many excellent products like the 100-Piece Primary Block Set. For ONLY $34.99, these beautiful, solid wood, high quality blocks come in a variety shapes, including triangles, rectangles, pillars and ramps. Or maybe your little ones "Like to Pretend." Find hundreds of imagination building products like the Circus Tent. For ONLY $34.99, this pop-up rainbow Circus Tent allows for pretend play in a home or classroom setting. This tent is large enough to accommodate more than one child at a time and it is a great way to transform your play space into a circus tent, a camping tent, a royal palace, a nomadic yurt or a fort! Shop by other interests in the Holiday Gift Guide including "Likes Music", "Likes to Read", "Likes Arts and Crafts" and more! With the great savings in our Holiday Gift Guide at Discount School Supply, you'll find great gifts for your little ones, hassle-free for LESS! Halloween candy, Thanksgiving pies and holiday sweets present significant nutritional challenges for all of us, especially the youngest ones. If you're looking to teach your little ones about how to make healthy food choices all year long, then shop Discount School Supply for some great educational tools. For example, show your little ones how to make a balanced meal with Build A Healthy Plate - 28 Pieces. For ONLY $29.99, this chart will teach children to categorize foods, make wise choices and, in turn, build a healthy plate! Ideal for teaching children nutrition and how to eat healthy foods, this product is exclusive to Discount School Supply! You can also have fun and teach about healthy food choices with the Make-A-Meal Healthy Food Set - 29 Pieces for ONLY $27.99. Children can learn about good nutrition and balancing meals from the five basic food groups while "buying," "preparing," and "eating" this colorful spread of realistic-looking vinyl food. Set contains a wide variety of provisions including fruits and vegetables, meat, bread, cheese and more. Activity guide included! Or set kids on the path to lifelong health and wellness with My Pyramid Food Banner with 30 Foods for ONLY $39.99. This colorful banner is based on the USDA MyPyramid for Kids food guidance system and it comes with 30 fun, puffy fabric foods that stick to the banner. Another product exclusive to Discount School Supply, this also includes an activity guide. But that's not all! For more educational supplies to teach your little ones about health and nutrition, shop the Science section of Curriculum Supplements at Discount School Supply. Find more ways to prepare for a nutritional holiday right here! And don't forget: moms, dads, teachers and caregivers save more on early education supplies at Discount School Supply. Shop categories like Arts and Crafts, Infant and Toddler, Dramatic Play, Active Play, Furniture, Mainpulatives and more! Click here to start saving and start preparing for a nutritional holiday right now! Review: "As soon as this was placed in the classroom, the children ran to it. It was the perfect height for children who have just learned to walk. They are able to practice walking by holding on to the sides which are smooth and designed for that purpose. There is ample storage for toys which the children can easily access and the mirror is great for the children to look at themselves." Our exclusive Angeles® Value Line products offer you remarkable quality and value. They're constructed of 5/8" thick, maple-faced melamine panels with 1/4" thick, wood-grained recessed back panels. Each piece features rounded edges, sanded smooth and fully finished for a classic look. Units are easy to clean and resistant to stains and scratches. All tools and hardware required for easy assembly are supplied. The Angeles® Value Line Toddler Discovery Center multipurpose unit promotes self awareness with an acrylic mirror. Children can locate toys, practice standing and walking all-in-one. Easy access storage. Assembly required. Measures 47-3/4"L x 14-1/2"W x 16-3/4"H. Easy to assemble. Easy to clean maple-faced laminate surface. Free Freight. Quick Ship. All Angeles® Value Line items have a lifetime warranty against defects in materials and manufacturing. Made in the USA. Save 15% During Wonderful Winter Sale! Hey moms, dads, teachers and caregivers: shop Discount School Supply during the Wonderful Winter Sale and save big with an extra 15% off! All Extended Families - Set of 28 for ONLY $50.90! Our exclusive set includes African-American, Asian, Hispanic and Caucasian Extended Families help teach children ethnic and cultural diversity and create a community. Make Discount School Supply's Pretend Play People a part of your block play, dramatic play, community or cultural area today. Colorations® Super Washable Chubby Markers - Set of 256 for ONLY $37.39! These markers hold 4.2 grams of SUPER washable ink. The sturdy, nylon, conical tip for each marker is pointed for making both fine lines and filling large coloring spaces. 8 standard colors: black, blue, brown, green, orange, red, purple and yellow plus 8 additional colors: fuchsia, gray, lime, magenta, tangerine, teal, turquoise and violet. Non-toxic and allergen-free, these markers are a must for your early learners! Career Costumes - Set of 6 for ONLY $135.95! These Career Costumes, exclusive to Discount School Supply, are made of machine-washable cotton twill and feature hook-and-loop closures in front for easy use. The set includes: chef, construction worker, doctor, fire chief, police chief and veterinarian. There is so much more to the Wonderful Winter Sale going on right now at Discount School Supply. But you must act fast! The extra 15% savings only lasts until November 22! Shop Discount School Supply for top quality early childhood education supplies at budget-saving prices. Find great deals on Arts and Crafts, early education Furniture, Curriculum Supplements, Active Play, Dramatic Play, Manipulatives and even great stuff for Infants and Toddlers! Save 15% for a limited time at Discount School Supply during the Wonderful Winter Sale. Shop here right now! "Great price and endless possibilities!" Check out this review of the Big Nylon Banner from Sue, an Adminstrator and very satisfied Discount School Supply customer from Sarasota, FL! Review: "We sponge painted and stamped these banners with acrylic paint, and they came out great. We've been able to hang them outside with no problems. We cut letters out of contact paper, affixed them onto the banners and painted over them. After we removed the letters, we outlined the letters with a permanent marker, and they look fabulous!" Two banners for the price of one! Decorate with fabric paint, foam, pom-poms, markers and more. Hang banners indoors and outdoors. Great for school sports days, carnivals, fundraisers. Sturdy white nylon banners have a metal grommet on each corner for easy hanging. Banners measure 30"W x 54"L.
Stretch Your Dollar with Budget Boosters! Now that the holidays are almost upon us, budget awareness is probably a top priority. If you need an affordable way to stock up on arts and crafts and other early education materials for your classroom or center, then there is good news. Affordability is the name of the game at Discount School Supply particularly when you shop Budget Boosters. Colorations® Lap-Sized Write & Wipe Board, 9" x 12" for ONLY $2.29! Write, draw or color on this personal size, 9"L x 12"W, white board. Corners are rounded and have a smooth, beveled finish. Board has white melamine finish so that ink erases easily. Manuscript Chart Tablet - 25 Sheets for ONLY $2.49! This 24"W x 16"H manuscript chart tablet is perfect for classroom demonstrations of handwriting. Ruled on both sides, this tablet is spiral-bound with stiff covers that provide a sturdy support. Plastic Jump Rope for ONLY $1.99! This jump rope measures 7.5 ft. It features red and white plastic and it is nearly impossible to tangle up! But that is not all. Find more budget-stretching deals when you shop Budget Boosters at Discount School Supply. Budget Boosters at Discount School Supply make it easy to stock up on early education supplies at affordable prices. Teachers, moms, dads and caregivers: be sure to visit Discount School Supply any time you need Furniture, Dramatic Play items, Active Play products, Arts and Crafts, Curriculum Supplements, Manipulatives and more for your classroom or center. Give your supplies a boost right now with affordable deals on top quality merchandise with Budget Boosters right here at Discount School Supply. Build a better road to the future with our fun, construction play set! Review: "I bought this product for my 3 year old who loves construction toys. I was looking for something to put on our sand table, and I was worried that these were going to be too small, but one of the reviews said that they were pretty big, so I decided to buy them. I got the toys, and I couldn't believe how nice they were and their size is just perfect. They are not small at all, and they are not too too big either. They are on the bigger side for what they are. My son cannot stop playing with them. I will definitely come back and purchase more items from this company and the manufacturer. My order processing was fast and easy. Toys arrived within the time frame indicated. We are very happy!" The Jr. Construction Play Set contains enough pieces to entertain 4-5 children at a time. Play set includes vehicles, workers, construction cones, tools, traffic signs, detour signs and more. Children can build with imagination - the possibilitites are endless. Ages 3 years and up. 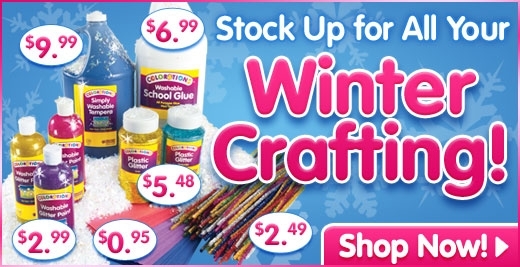 Stock Up Now for Winter Crafting! As the weather is cooling, the outdoor activies of summer turn into the indoor activities of winter. And one of the best indoor activities for young children is crafting! Colorations® Extra-Safe Plastic Glitter - 1lb. for ONLY $5.48! Add some glitz and sparkle to your winter designs with our extra-safe plastic glitter. Plastic glitter doesn't fade or tarnish and is glass and metal free. Has greater volume than metal glitter. More for your money! Choose black, blue, gold, green, multi, orange, pink, red, silver, turquoise, violet or white. Wooden Photo Frame Ornaments - Set of 12 for ONLY $5.99! Each of the 12 wooden photo frame ornaments measure 3 3/8" in diameter. Includes latch backing and clear photo protector. Decorate with paint, markers, pencil, beads, crayon, glitter and more (not included). Create-A-Calendar - Set of 12 for ONLY $17.99! Discount School Supply's exclusive "blank" calendar is printed with the name of each month, days of the week and a grid for children to fill in the dates. Large design space allows children to draw or paint a picture for each month. Can be used for any year (or school year) and makes a great gift! Set includes 12 spiral-bound calendars 9" x 11" each. Make the most out of your indoor activities with some awesome and affordable craft ideas like the ones shown above. Or click here for more ideas available only at Discount School Supply! Moms, dads, teachers and caregivers: don't forget that Discount School Supply is the most affordable place to shop for top quality Arts and Crafts, Manipulatives, Furniture, Active & Dramatic Play products, Curriculum Supplements and more great stuff for early learners. Visit Discount School Supply today for our Winter Crafting sale and visit often for all of your early education needs. Click here for more!